It’s death, death, and death seven more times with the latest “Nine Deaths of Six” trailer for Little Nightmares. Little Nightmares first debuted in 2014 under the title “Hunger” from Tarsier Studios. The brief teaser showed the raincoat-clad character Six sifting her way through a horrific structure, home to malformed giants intent on her demise. Over a full year of silence later, Little Nightmares resurfaced in 2016 with a new gameplay trailer, highlighting more of the claustrophobic areas within the underwater labyrinth. According to developer Tarsier Studios, apart from the unnerving ever-present dollhouse aesthetic of being just inches tall in a huge grotesque world, Little Nightmares is designed to prey on some of the more common primal fears of its audience. Earlier today, publisher Bandai Namco revealed a brand new trailer intent on showing the harsh side of Little Nightmares; titled “The Nine Deaths of Six”, the trailer showcases more death than actual gameplay. 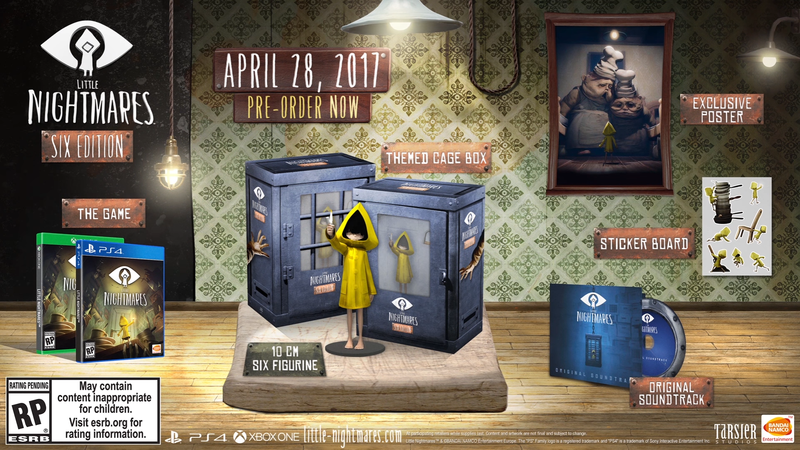 The trailer closes with the reveal of the “Little Nightmares: Six Edition” collector’s edition, currently available to pre-order through various outlets. Though only available for Xbox One and PS4, the Six Edition includes a poster of the chefs, a sticker collection, physical soundtrack, and a 10cm “Six” character statue, all housed within a cage-themed box. Little Nightmares will release for PC (via Steam), Xbox One and PS4 on 4/28. Again, the Six Edition is only available for consoles, but can be pre-ordered for $34.99.